Mastering OpenCV 4 - my new book! I'm very excited to announce the publication of my latest Mastering OpenCV book! With many new chapters and all the others re-written practically from scratch, this edition is by far the best ever. The excellent David Millán Escrivá and I go deep and wide across the range of capabilities of OpenCV, explaining the theory and implementing recent real-world vision tasks from the ground up. It's been baking for many months in the oven, rising slowly, and finally ready for consumption... yum! It runs VERY fast. No loops involved, all matrix operations. In C++ this code would look gnarly.. Thanks Numpy! Reporting on a project I worked on for the last few weeks - porting the excellent Gesture Recognition Toolkit (GRT) to Python. Right now it's still a pull request: https://github.com/nickgillian/grt/pull/151. Not exactly porting, rather I've simply added Python bindings to GRT that allow you to access the GRT C++ APIs from Python. Did it using the wonderful SWIG project. Such a wondrous tool, SWIG is. Magical. Continue reading "Take a SWIG out of the Gesture Recognition Toolkit (GRT)"
This is my first trial at using Jupyter notebook to write a post, hope it makes sense. In class we've manipulated face images with neural networks. One important thing I found that helped is to align the images so the facial features overlap. It helps the nets learn the variance in faces better, rather than waste their "representation power" on the shift between faces. The following is some code to align face images using the excellent Dlib (python bindings) http://dlib.net. First I'm just using a standard face detector, and then using the facial fatures extractor I'm using that information for a complete alignment of the face. Continue reading "Aligning faces with py opencv-dlib combo"
It includes videos, slides and code, with hands-on demonstrations in class. I made several scripts to make it easy to upload python code that performs an ML inference ("prediction") operation on AWS Lambda. Last time I've posted about cross compiling TF for the TK1. That however was a canned sample example from TF, based on the bazel build system. Let's say we want to make our own TF C++ app and just link vs. TF for inference on the TK1. Now that's a huge mess. First we need to cross-compile TF with everything built in. Then we need protobuf cross-compiled for the TK1. Bundle everything together, cross(-compile) our fingers and pray. Continue reading "Cross Compile TensorFlow C++ app for the Jetson TK1"
Been looking around for a solid resource on how to get Tensorflow to run on the Jetson TK1. Most what I found was how to get TF 0.8 to run, which was the last TF version to allow usage of cuDNN 6 that is the latest version available for the TK1. The TK1 is an aging platform with halted support, but it is still a cheap option for high-powered embedded compute. Unfortunately, being so outdated it's impossible to get the latest and greatest of DNN to work on the CUDA GPU on the TK1, but we can certainly use the CPU! So a word of disclaimer - this compiled TF version will not use the GPU, just the CPU. However, it will let you run the most recent NN architectures with the latest layer implementations. Cross compilation for the TK1 solves the acute problem of space on the device itself, as well as speed of compilation. On the other hand it required bringing up a compilation toolchain, which took a while to find. I am going to be assuming a Ubuntu 16.04 x86_64 machine, which is what I have, and really you can do this in a VM or a Docker container just as well on Windows. Continue reading "Cross-compile latest Tensorflow (1.5+) for the Nvidia Jetson TK1"
For a class I'm teaching (on deep learning and art) I had to create a machine that auto starts a jupyter notebook with tensorflow and GPU support. Just create an instance and presto - Jupyter notebook with TF and GPU! Well... building it wasn't that simple. Continue reading "An automatic Tensorflow-CUDA-Docker-Jupyter machine on Google Cloud Platform"
First let me open by saying projector-camera calibration is NOT EASY. But it's technically not complicated too. It is however, an amalgamation of optimizations that accrue and accumulate error with each step, so that the end product is not far from a random guess. So 3D reconstructions I was able to get from my calibrated pro-cam were just a distorted mess of points. Nevertheless, here come the deets. 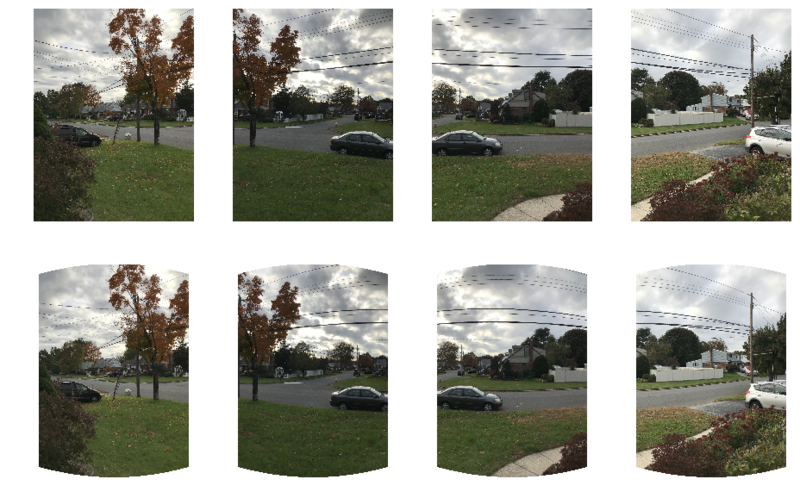 Continue reading "Projector-Camera Calibration - the "easy" way"
As part of the computer vision class I'm teaching at SBU I asked students to implement a segmentation method based on SLIC superpixels. Here is my boilerplate implementation. This follows the work I've done a very long time ago (2010) on the same subject. Setup a graph with a straightforward energy model: Smoothness term = K-L-Div between superpix histogram and neighbor superpix histogram, and Match term = inf if marked as BG or FG, or K-L-Div between SuperPix histogram and FG and BG. 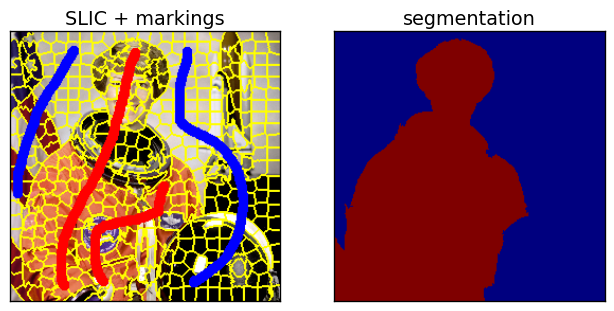 To find neighbors I've used Delaunay tessellation (from scipy.spatial), for simplicity. But a full neighbor finding could be implemented by looking at all the neighbors on the superpix's boundary.